RUMOURS of a small Suzuki sports bike have been around for at least five years – and not without foundation but such a bike has finally been spotted on test in India. 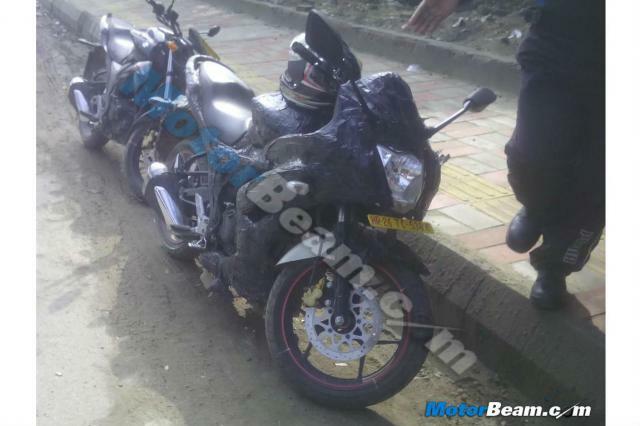 MotorBeam.com has captured this image of the forthcoming machine, which is due to be 150cc in India due to local laws. The gaffa tape leaves little doubt as to its identity. While Suzuki’s original plan was for a GSX-R125 with a water-cooled single aimed at European learners as a rival to Yamaha’s R125, this bike is a simpler, air-cooled creation. Apart from the fairing, it’s identical to the naked Gixxer 150 already sold in India (yes, it’s officially called a Gixxer: one is helpfully parked just behind the new prototype for reference). Both have the same seat, frame, wheels, brakes, tank and engine. Even the wide bars look identical, so it really is just the fairing that differentiates the new version. So it's effectively a new fully-faired Gixer - just not the litre one we'd have liked. It could be called the GSX-F150. If either bikes ever make it to Europe, it would be as 125cc machines.